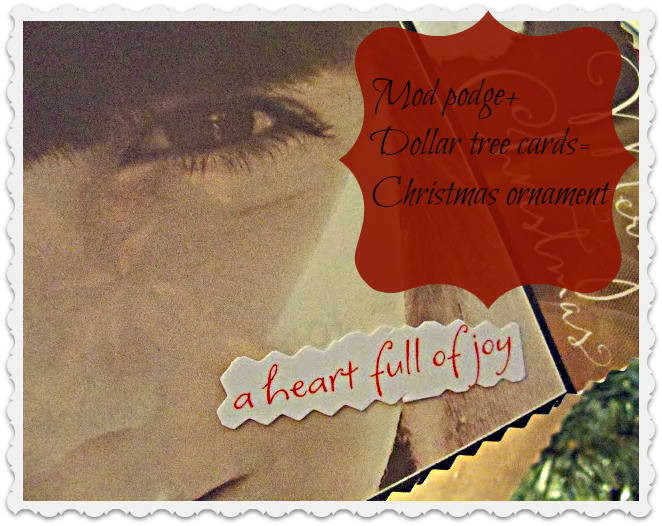 Today I am sharing sentimental ornaments mod podge, and the Dollar tree items. Had some recent fabulous family photos, that I thought I would make into some ornaments for the tree. Here is the short self explanatory tutorial, and the end result. I just love seeing my family on the tree. I still have some more to make. Cut the card with my craft scissors, and modged podged the picture on the card. And there you have it on the tree. I love it! And look, there is a CLOTHES pin to attach it to the tree! I kept mine original, I could have made in glitter but there is enough bling going on. And I just love this pic of my Mom and I. What a fun, cheap and easy project. I will have for a life time! Thanks for all the hosts that I will be joining this week. I do have to go finish my Christmas cards and shopping. You go on with your bad self!!! I love this idea, and have never seen THIS done before!!! !Great job lady! These are darling! Mind if I give it a try?! Oh no! Here we go! She's got the modge podge out again. LOL! Seriously, those are wonderful! I would give it a try if I wasn't needing to finish up my crafty wreaths. I like the one of you and your Mom too, yall are both so pretty and sooo photogenic. Great job! Those are great Debbie. You are getting quite crafty my friend. Nice to see the Podge in play. What a fun idea. I had missed the Podge while you were away on "mental break". I knew the Podge would get the best of you. I think I need to wake up more from my wee-little nap before commenting anymore. Girlfriend, I love your pretty Christmas photos on the tree..what a great idea! You did a beautiful job…sooo fun and festive! Thanks for sharing the idea…you always inspire, my friend! Yep, I'm lovin this project also! The photos are wonderful and love them on the tree! I love it!! I love family photographs all around and each time you showcase a part of your home, I'm just scanning your posts looking for your large picture-frames. 🙂 Very warm and fun!! I love that picture of Jack! Those are cute. Isn't Mod Podge amazing. What a wonderful way to celebrate your family!!! Too perfect and a great idea with the clothespins! Too cute! I bought some Modge Podge awhile back, but haven't opened it. Would you believe I've never made anything with Modge Podge??? Love this idea. Great project. This really is a super idea! Who doesn't love an easy craft, especially one that adds something so special to your tree? Nice job, Debbie! You clever girl. Love the one of you and your mom. I love that idea! Cute cute! This is SUCH a charming idea and such a fun keepsake for each Christmas! Very creative! Great idea Debbie, they look great. Love the one of you and your mom and the old worn look. Okay now Crafting Mama…..great idea! Love your use of family photos in your projects! I love the one of you and your mom! Sweet! Adorable idea. What a way to make your tree even more personal. I see so many ides for modge podge that I'm going to buy a jar tomorrow. Thanks for showing us how! These are really sweet and so personal!! Thanks so much for linking up to the Ornament Party!! I've never seen this. It turned out great!! Thanks for visiting & following me. I'm following you now!! Hey! I could even do this one! 🙂 What a great idea Debbie and it looks just perfect on your tree! I always knew you were going to make these holidays special for us. So, what do you have up your sleeve next……mmmmmmm… wondering. Oh you broke out the good ole Mod Podge! Mine has been slowly fermenting in a cupboard. I think I burned myself out for a while there but you've inspired me to go and rescue it!! Your decorations are awesome! What a great way to display photos! Love the idea of using clothespins to hang them. Very cute girl and thanks for the shout out :)! A really cool way to re-purpose your old Christmas cards!! Oh my! Love this!! Great idea!! !